The Tortoise Banker: I've Joined the Yakezie Challenge! I've Joined the Yakezie Challenge! 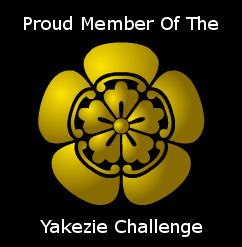 It brings me great pleasure to announce that I am joining the Yakezie Challenge! My current US Alexa ranking is #469,649 and my goal is to drop below the 200,000 mark by January 14th, 2014. I look forward to supporting any lifestyle and personal finance bloggers I can, and know this adventure will take a lot of commitment. The good news is I LOVE helping others reach their personal financial goals and I look forward to the challenge! With that, I'd like to thank YOU for visiting my site and invite you to contact me if I may be of service to you. Welcome to the Yakezie challenge Charles! Just thought I'd let you know that it is the global Alexa rank that has to be under 200k. There's a bit of work to be done, but it can of course be done! Good luck! Welcome to the challenge Charles! Work hard and you'll be surprised by how quickly that ranking falls. Just focus on creating a great blog and the rest will take care of itself! Good luck. Thought I'd stop by and reciprocate the good luck wishes. Here's to your success!